The World Economic Forum has kicked off in Davos, and today the Dow is down some 300 points. She cited the U.S.-China trade war, Brexit, and China’s slowing economy as factors in the down estimate. But there are companies out there doing their part to ensure that everybody gets paid. For instance, Apple announced that 74 of the top 100 U.S. merchants now accept Apple Pay, including Target and Taco Bell. Finally, a reason to really use my Apple Watch for something besides a timer for Trader Joe heat ups! And speaking of fast food, sorry, but Traders Joe may be the order of the day, as Munchery has announced it is going to end operations effective immediately and will refund any outstanding orders. Munchery had raised some $125.4 million in venture capital and, according to a story in the San Francisco Chronicle, its kitchens had reportedly produced many more orders than they sold. MacRumors is reporting that 7-Eleven announced yesterday that Apple Pay and Google Pay are accepted at nearly all of its 10,000+ locations across the United States. The company also highlighted some of the technology improvements that it has introduced recently including the 7-Eleven NOW app for placing on demand orders with Apple Pay, the 7Rewards loyalty program that allows customers to earn points for purchases, and the 7-Eleven Bot on Facebook Messenger to allow customers to get quick answers to questions. Click to enlarge the infographic. As the first new technology platform for business to emerge since the World Wide Web, mobile computing represents one of the greatest opportunities for organizations to expand their business. Based on nearly 1,000 customer engagements, 10 mobile-related acquisitions in the last four years, a team of thousands of mobile experts and 270 patents in wireless innovations, IBM MobileFirst offers an array of solutions that helps businesses connect, secure, manage and develop mobile networks, infrastructures and applications. 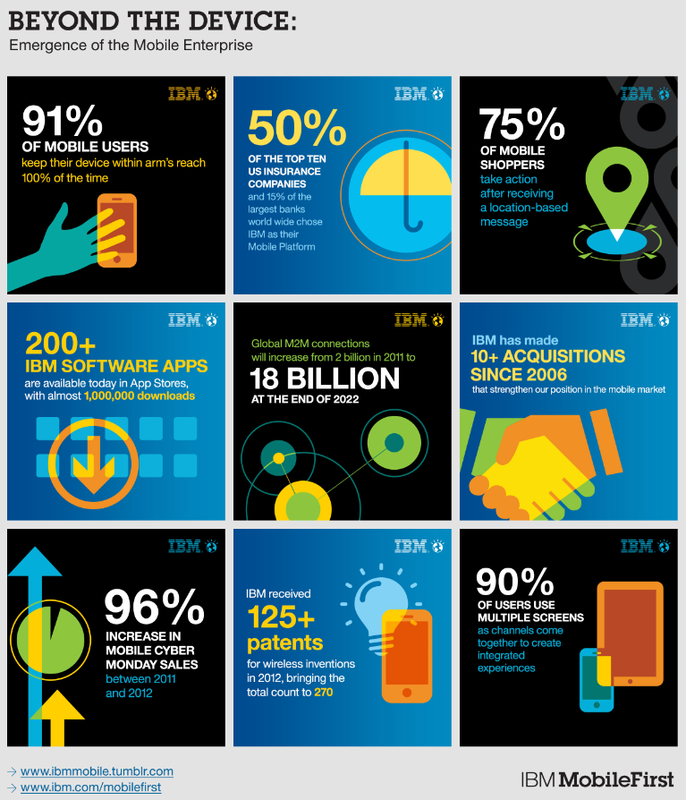 IBM is going big on mobile. Today, the company unveiled “IBM MobileFirst,” a comprehensive mobile strategy that combines security, analytics, and application development software, with cloud-based services and deep mobile expertise. Using IBM MobileFirst solutions, businesses can now streamline everything from the management of employee mobile devices, to the creation of a new mobile commerce app that will transform their entire business model. Today’s move by IBM builds off of its experience helping nearly 1,000 customers become mobile enterprises, and takes advantage of its thousands of mobile experts and 270 patents in wireless innovations. IBM has made 10 mobile-related acquisitions in the past four years alone. IBM also announced an expanded relationship with AT&T to provide developers with tools to create faster, richer mobile apps and services for customers. For instance, organizations can now quickly incorporate payment and messages into their apps. With this expanded partnership, the AT&T API Platform, featuring IBM Worklight Adapters, will enable the more than 31,000 members of the AT&T Developer Program to quickly create and securely deploy enterprise apps that improve subscriber engagement and customer loyalty. With these adapters that support AT&T’s ecosystem of APIs including those for speech, SMS, device capabilities, notary management and payment, developers can quickly and securely create rich, business-ready apps across a variety of platforms including iOS, Android and Windows. Through IBM MobileFirst, IBM is providing companies with the essential tools to take advantage of new business opportunities being enabled by mobile. To be successful in embracing mobile for driving revenue growth, clients must have an integrated strategy for mobile, cloud, big data, social business and security. Today’s announcements from IBM help clients harness these complex technologies to drive innovation and growth. IBM’s mobile solutions portfolio provides the key elements of an application and data platform with the management, security and analytics capabilities needed for the enterprise. IBM MobileFirst Platform – New updates include expanded capabilities of IBM Worklight to simplify deployment. It also features single sign-on capabilities for multiple applications. A new beta of the Rational Test Workbench for mobile helps to improve the quality and reliability of mobile apps. IBM MobileFirst Security – IBM extends its context-based mobile access control solutions and expands mobile application vulnerability testing with support for Apple iOS apps with the latest release of AppScan. IBM MobileFirst Management – New updates to IBM Endpoint Manager include enhanced support for Bring Your Own Device (BYOD) programs and increased security standards that are critical to governments and regulated environments. IBM MobileFirst Analytics – IBM is expanding its Tealeaf CX Mobile solution to give enterprises more visual insight into mobile behaviors so they can better understand where improvements are needed and create exceptional and consistent consumer experiences across mobile devices. To provide organizations with maximum flexibility and accelerate their adoption of mobile computing, these solutions can also be delivered through cloud and managed services. Enterprises are embracing the mobile revolution at a rapid pace. IBM has thousands of mobile experts to help clients understand how industries will be transformed in a mobile world, based on client engagements across more than a dozen industries. IBM MobileFirst Strategy and Design Services – Clients can tap into IBM expertise to map out a mobile strategy for employees and customers, and key experience design skills from IBM Interactive to build compelling mobile experiences. IBM’s new Mobile Maturity Model can assess how a business is progressing towards becoming a mobile enterprise, while new Mobile Workshops help clients develop applications, architect infrastructure and accelerate their mobile progress. IBM MobileFirst Development and Integration Services – IBM offers services that help organizations roll out a mobile infrastructure and manage mobile application portfolios and BYOD environments. Enhanced Network Infrastructure Services for Mobile provide IT network strategy, optimization, integration and management. Mobile Enterprise Services for Managed Mobility help manage and secure smartphones, tablets and devices across a business. Mobile Application Platform Management helps speed deployment of mobile infrastructure to develop mobile applications more easily and quickly. According to IBM’s recent Tech Trends Report, only one in 10 organizations has the skills needed to effectively apply advanced technologies such as mobile computing. To help overcome this skills gap, IBM is rolling out a series of resources to help its ecosystem of developers, partners and academics tap into the mobile opportunity and augment existing skills or develop new ones. Developers – IBM today is announcing a relationship with AT&T that will enable developers to enhance mobile apps by using IBM Worklight to access AT&T’s APIs in the cloud. Now, developers have another tool with AT&T to quickly and easily create apps with rich features such as speech recognition and rapid payment. IBM is also rolling out new technical assets on developerWorks and CodeRally, a developer game community. Business Partners – With Ready for IBM MobileFirst, Independent Software Vendors (ISVs) can also embed mobile technologies into their solutions and Software Value Plus now provides mobile certifications, workshops and incentives for resellers and systems integrators. Academics – To help train the next generation of mobile developers, IBM is offering new faculty grants for curricula development. IBM is also making IBM Worklight available, free of charge, for the classroom and via online training to teach both students and faculty to develop for mobile environments. IBM Global Financing, the lending and leasing arm of IBM, can also help companies affordably transform into mobile enterprises. Credit-qualified clients can take advantage of simple, flexible lease and loan packages for the IBM MobileFirst portfolio — some starting at as low as 0% for 12 months with no up-front costs — allowing businesses to acquire essential technology and services while managing cash flow more effectively. To learn more, visit the IBM MobileFirst site. You can also follow @ibmmobile, #ibmmobile on Twitter, and see IBM MobileFirst on YouTube, Tumblr and Instagram. Also, watch the video below (3:46), for it paints a broad, comprehensive, and gorgeous “picture” of the enterprise mobile opportunity and challenges.